THE RP Blu Girls expressed confidence of getting a podium finish in the 11th Asian Women’s Softball Championship from November 28 to December 5 in Taichung City, Taiwan. 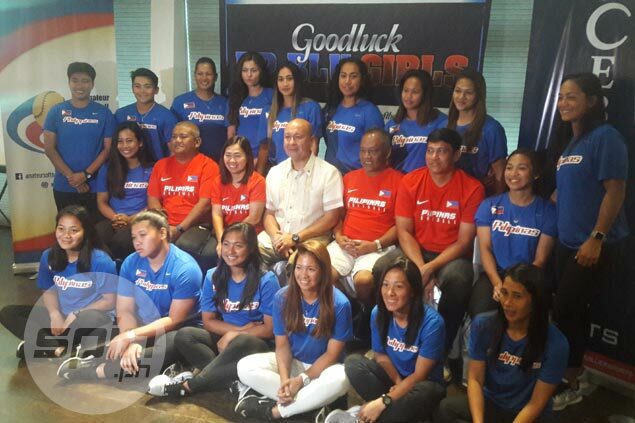 Head coach Randy Dizer said the Cebuana Lhuillier-backed squad are aiming high in the tournament, which also serves as a qualifier for the 2018 Asian Games and the 2018 World Championship. Dizer said the top five teams in the 12-team Asian Women’s Softball Championship will play in the Asian Games, while the top three squads will also move to the World Championship. “We are not going there just to participate. We are there to get the medal,” said Dizer during Thursday’s sendoff at the Cebuana Lhuillier office in Makati City organized by Amateur Softball Association of the Philippines (Asaphil) president Jean Henri Lhuillier. Leading the way for the RP Blu Girls in the Asian tilt are Cheska Altomonte of Ateneo, Arianne Vallestero of National University, Angelie Ursabia of Adamson, Mary Ann Antolihao of University of Santo Tomas, Lyca Basa of Adamson, Mia Macapagal of NU, Ezra Jalandoni of Bacolod, Royevel Palma of Tanauan City, and Joy Lasquite of Bacolod. The team is also beefed up with NCAA Division I products Chelsea Suitos of Arizona, Sky Ellazar of Maryland, Kailee Cuico of Oregon, Garie Blando of University of Nevada Las Vegas, Kayla Joyce of Eastern Kentucky, Dani Gilmore of Oregon State, Reese Guevarra of Connecticut, and Hailey Deeker of Oregon. Lhuillier believes the Blu Girls will be able to reach a podium result after last year’s World Cup of Softball and the Canada Cup International Softball Championship. “I’m confident we will be battling it out for the top honors considering their excellent showing in their recent tournaments. We’ve already beaten world number three Canada twice, world number four Australia, and Asian number three Chinese Taipei a few months ago, and they’ve been training diligently, so the team is in good shape,” said Lhuillier. Lhuillier said the ultimate goal is to qualify for the 2020 Olympics where softball is making a comeback. He admitted though that it will be a tough challenge as only six teams will make it to Tokyo in 2020. Dizer said the team put a premium on defense by bringing in six pitchers in Antolihao, Basa, Macapagal, Jalandoni, Palma, and Lasquite. “Our defense is solid right now. If they hit the same way they hit in the last two tournaments, we will be there,” said Dizer.